Description: This stamp is made by The River City Rubber Works Company. Ideal for scrapbooking or for making any greeting card and backgrounds too. This is the small version of Believe, the larger version is also sold here. Description: This stamp is made by The River City Rubber Works Company. Ideal for scrapbooking or for making any greeting card and backgrounds too. This is the large version of Believe, the small version is also sold here. Description: This stamp is made by The River City Rubber Works Company. Ideal for scrapbooking or for making any greeting card and backgrounds too. CREATE!! Description: This stamp is made by The River City Rubber Works Company. Ideal for scrapbooking or for making that special card for the Dance fan in your life!! Description: This stamp is from All Night Media. ALOHA!! I know I can think of a million ways to use this!! Hawaii, my most favorite place!! ALOHA!! Description: From Hero Arts come this wonderful Holiday saying stamp. It reads: Believe, perfect for any holiday occasion or really any time of year! Description: This stamp by Hero Arts is perfect for scrapbooking, greeting cards and backgrounds too. Description: This stamp from All Night Media is part of the Posh Impressions Collection. 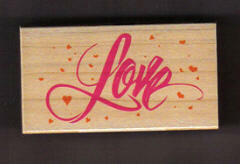 Use this stamp to express your love at Valentines Day or anytime. Description: This stamp from All Night Media is part of the Posh Impressions Collection. 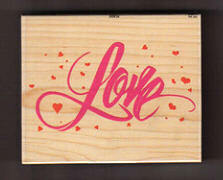 Use this stamp to express your love at Valentines Day or anytime. The Jumbo size of this stamp will fill the entire front of a card. Description: This stamp from Hero Arts is a simple word stamp that says "Spring" and can be used in greeting card creations or would be perfect in scrapbook pages. It can headline almost anything you want to stamp. Size: 3" X 3/4", Image size is 1 3/4" X 3/4"
Description: This stamp from Hero Arts is a simple word stamp that says "Summer" and can be used in greeting card creations or would be perfect in scrapbook pages. It can headline almost anything you want to stamp. Size: 3" X 3/4", Image size is 2 1/4" X 1/2"
Description: This stamp from Hero Arts is a simple word stamp that says "Autumn" and can be used in greeting card creations or would be perfect in scrapbook pages. It can headline almost anything you want to stamp.